A small post to talk about the updates currently waiting for review. A bug is present in the last update of SpiderChart causing a crash when launched on iPad. A fixed version is already waiting for Apple's Approval. I apology for the inconveniences caused by this situation. SoHO Viewer version 2.2.2 is waiting for review. It correct bugs that appeared in previous update. As I haven't posted for a long time, here is a summary of what has been done since last post. SpiderChart 1.0: waiting for review! As promised, SpiderChart 1.0 was submitted to apple for validation. I hope you will see it very soon on your AppStore. At least the "first real" version of Spiderchart is coming! I plan to submit Spiderchart version 1.0 at the end of this week! This version is only mean to fix a possible issue while being connected through a proxy server. SoHO Viewer is now in version 2.0. This version resolves a major fault: SoHO Viewer was always re-downloading all pictures at launch. I am pleased to announce you this fault is no more. The application now uses a gateway in order to know which pictures has been updated and should be downloaded. 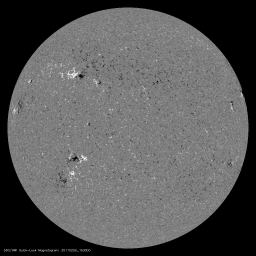 I have published a quick update to SoHO Viewer before the big one. Double tap on a picture to zoom in / zoom out. I have just submitted an updated version of SoHO Viewer for review. Improved downloading system with better state indicator.Images are now refreshed on screen as soon as the new picture is retrieved. For improving quality for iPhone 4 and iPad users, the images downloaded are now 1024*1024 instead of 512*512. Improved memory management and performance. SoHO Viewer 1.5 has been approved. An updated version of SoHO Viewer has been submitted to the AppStore and is currently waiting for review. It's add the long awaited description of the instruments. Next version will include French localization. Update: This upgraded version has been approved and should been available in a few hours. I have just submitted an updated version of SoHO Viewer to the App Store. It is now waiting for review! MDI images are now replaced by images from the HMI instrument of the Solar Dynamics Observatory. This update is now available as a free download on the iTunes App Store. An update of SoHO Viewer is currently being prepared. This update will only bring one thing, but I hope you will agree it will a major improvement. In the current version, all pictures are re-downloaded while refreshing, even if they haven’t been updated on Nasa’s website. In the new version to come, only updated pictures will be re-downloaded.